Best weather in Europe year around. 2½ bedroom, 2 bathroom, sleeps 5-6. 1. A vacation apartment on the beach. 2 bedrooms, kitchen, 2 bathrooms, living room with dining. 135 sqm. Terrace. An amenity for entertainment and internet. In the apartment you find information about local spots for food, drinks, restaurants, and other attractions. Even better, we have more favourites on our web site. In the living room there is a large L-shaped sofa where all guests can socialize in an airconditioned environment. On the terrace you have outdoor dining and chilling area with the Med in the background. In the garden there are sun chairs. 7. Fresh Towels and linen. We provide you with fresh towels and linen. You get more space for packing things you may need and do not have to worry about laundry. We have an emergency telephone number if any problem arise. Our kitchen is fully equipped, so you can easy cook anything you like. To make your vacation even better we have dishwasher and wash machine. Costa del Sol is the most popular all year round destination in Europe. Just take a few steps to our beach pool or take a swim in the Med. Also a golfer’s paradise. Dominion Beach is 10 minutes from Marbella and the world famous Puerto Banus. 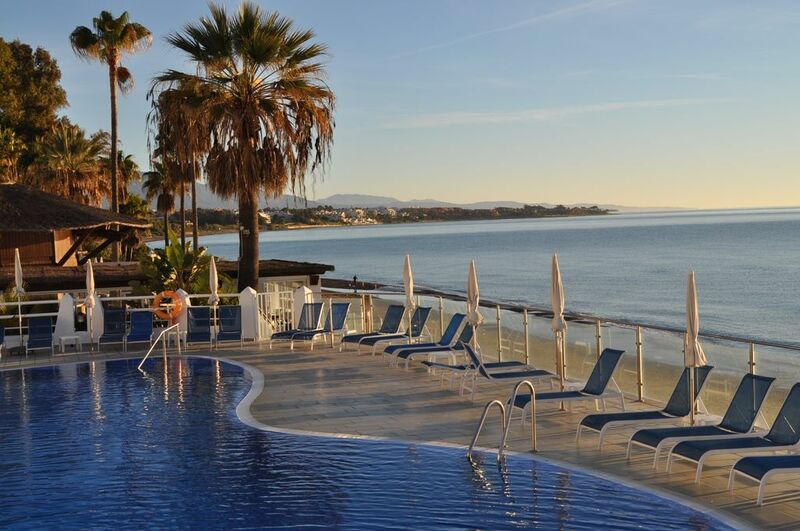 The close Estepona, once a sleepy fishing village, has now blossomed into a truly international Mediterranean coastal resort offering a wealth of activities and services. The charm and the character of Estepona remain as always - typically 'Andaluz'- the welcome, the warmth and the appetite for life as strong as ever. Our property features a beautiful garden with pools and beach restaurant. 130 sqm ground floor apartment and sheltered terrace with 2 bedrooms and 2 bathrooms, an office, air-conditioning, sea view, luxury standard. Fully equipped kitchen. Service package: Linen, towel and cleaning service included as well as a welcome package. For more information contact owners for website details. DB has its own beach restaurant and is within walking distance several restaurants. Our beach beach apartment: Apartment in the ground floor a few steps from the beach. Sun bathing chairs and sea view with Gibraltar and Africa in the south. Satellite TV, over 30 channels, including movie channels, sports and numerous international channels. Heating /air conditioning is standard, marble floors throughout and the style is one of restrained elegance. There is a 24 hour security service to provide privacy and security for residents. It is set in some of the most beautiful gardens on the Costa del Sol, indeed it has won prizes for the variety of plants and standard of maintenance. Its formal landscaping, ornamental pools and fountains are reminiscent of the Alhambra Palace. There are 2 pools, one by the side of the beach and beach bar, the other in a sheltered part of the lovely gardens. The beach is wide and goes all along the coast. Bar and restaurant by the swimming pool. In a few minutes walk restaurants and a shopping center. Position 5.0940 and 36.4447. Golf: Golf details: The costa del Sol can truly be described as the perfect haven for the golfer - a golfers paradise. There are numerous of golf courses to choose from and many internationally famous for the tournaments they have held (including the Ryder Cup)within a five mile radius. You can play golf here for more than 360 days a year, without getting wet. The area: Estepona, Marbella and the famous Puerto Banus (playground for the rich and famous) are close at hand with abudance of restaurants and bars to suit every taste. Dominion Beach has a lovely beach. Benahavis is 7 km away and is a tiny mountain village with approximatly 28 restaurants and bars and a craftsmans center. Futher afield you will find Gilbraltar for cheap duty-free shopping. Istan for it´s scenery, the lake and the mountain. Granada for the Alhambra Palace and architecture. Jerez for the Sherry tasting. Nerja for the largest natural caves in Europe. Seville for real flamenco. Casares, a picturesque mountain village. After 40 years in the insurance business we decided to start a new life in a warmer climate. Southern Spain is the only part of the western Europe with a lovely winter climate. Easy lifestyle and cheaper livingscosts made the decision easy. This is a 5-star property on the beach. A short trip away (10-15 minutes) from the bustling beaches around Marbella and Puerto Banus. This wonderfully decorated apartment is situated in the well-known Dominion Beach, close to Laguna Village and Kempinski Hotel. Complete with 2 double bedrooms, every one decorated to the highest standard, this apartment can easily accommodate 4 persons with a large dining area taking you onto the lounge with modern, comfortable sofas facing a TV with satellite. There are 2 fully equipped en-suite bathrooms and another shower/bathroom for guests. The cool terrace is the perfect place to relax in total tranquillity on a summer’s day facing the beach. The complex also consists of restaurant, bar & 3 pools for exclusive use for our guests & is also just moments away from the beach and famous Laguna Village for those you would rather sit under the sun in all luxury before the night begins with their cocktails, bar & disco. Fully air conditioned, this is also an ideal setting for golf lovers, at only 10min distance from Nueva Andalucias courses. Take a walk on the beach and enjoy life. 122 sqm apartment + sheltered terrace. Ideal for children/youth families. Sunbathing is possible in the winter months too. Lovely summer weather through October and November. Golfers finds famous golf courses i e Valderama, Sotogrande, Las Brisas within easy reach. Nearest course is just a few minutes away. Nightlife in Puerto Banus 10 minutes away. For families: Selwo Aventura - a fantastic animalpark just around the corner. Crocodile park in Fuengerola. In Benalmadena you take the cable way up to the top of the mountain where you can see a horse show and a fantastic falconery. Take a car up in the mountain and visit the white villiges of Ronda, Benalmadena, Casares. Or drive to Jerez for sherry tasting and Spanish Horse School. Have just booked again for next year ! Cosy, well equipt apartment a few steps from the beach...stayed her in 2010 and 2011 and have just booked again for 2012. Peter the owner has always been prompt to respond to queries and the managing agents are local and are wonderful to deal with. They have arranged extras and cleaning as required. A small repair was needed this year and someone arrived at the door within hours. Being on the ground floor, the apartment is childfriendly and has shady terrace and a sunny garden....you enjoy views of pretty flowers, swinging palm trees and listen to the sea lapping against the shores. Dominion beach is an established gated community with 24 / 7 security and has it's own wonderful beach bar / restaurant. There is an enterainment plan in the summer. Estepona, Puerto Banus, Marbella are a short drive away.....it takes a little less than an hour to drive from Malaga. On the doorstep within a few kms you have Laguna Beach, Selwo safari park and a wonderful horse riding school, Escuela-ecuestre All in all a wonderful palce to stay and we are already looking forward to returning in 2012.
that I couldn´t write earlier. Ronda - the four weeks stay seemed to short at the end. And in whole March we had not a single rain day, whereas in our home town Munich there was still snow and ice and freezing temperatures! next spring- we will contact you in time. Thank you again - enjoy your life! Dominion Beach is situated at the beach just south of Marbella and the world famous Puerto Banus. Just take the motorway from Malaga Airport and you will arrive easily in 50 minutes. Enjoy the sunny and warm beach at Dominion Beach. Shoping center in La Canada, Laguna Village and Puerto Banus. Restaurants of all tastes. Miles of beaches. Golf as much as you want. Sun all year around. Mountain villages like Ronda, Cacares, Benahavis. Supermarket and restaurants within walking distance. There are about 30 golf courses on the Costa del Golf. Many golf courses demand official handicap - 28 for men and 36 for women. Green card players can always play at, for instance, Estepona Golf , Pay as You Play course. But there are several others. Ski: Sierra Nevada is situated within 2 hours drive. Sit on the beach in the morning and go skiing in the afternoon!